By Kennedy Odede, Founder & CEO of Shining Hope for Communities (SHOFCO), a non-profit grassroots organisation combating extreme poverty and gender inequity in Kenya. A decade ago, with just a 20-cent soccer ball and a group of young people that demanded change, I created a movement. I did not have a formal education, a fancy job or money. I just had a vision for the community I grew up in - a place that I knew was much more than the poverty that consumed its people every day. Growing up in the slums of Kibera, my family couldn't afford to eat every day, let alone afford the $3 monthly tuition for a nearby school. So, while I never formally learned how to write, I learned from my friends' schoolwork. While they were in school, I looked for newspapers littering the streets or crumpled up in the garbage. I struggled through many words, and the ones I didn't know the meaning of, I'd ask my friends to ask their teachers for me. While I did not have many opportunities for a formal education, it was still more opportunity than most girls in the slum had. For many families, even if they can afford to send a child to a school, they would rather invest in a boy instead of a girl. Boys are thought of as more worthy and valuable because they are seen as an economic contribution, even though women and girls typically reinvest 90% of their income in their families - men are found to reinvest only 30% to 40%. Kibera is one of the largest slums in Kenya - a place where the oppression and struggle of daily life ensures that the light of hope is unable to shine. My mom is a strong and inspiring woman who like many girls in Kenya, was never able to go to school. She did the best she could and even started a loan and empowerment group for women in Kibera. But, not having a chance at education still resulted in her being locked into the cycle of generational poverty. The story of my mother's underdeveloped potential is not unique. Alongside the lack of education, I saw many young girls become victims of sexual violence and become infected with HIV - effectively having their childhood and futures stolen from them. I knew that things would never change if our view on women didn't. I knew that education was the only way to end the cycle of poverty and show how valuable our girls really are. 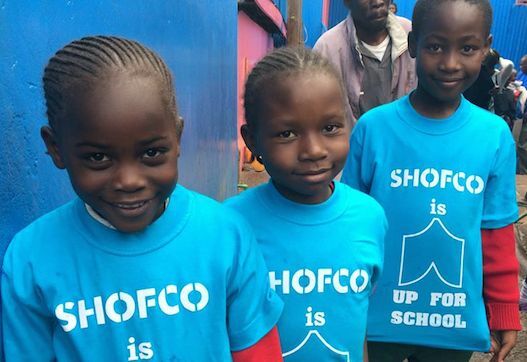 I created SHOFCO, a non-profit grassroots movement that combats poverty and gender inequality through linking essential social services - like access to clean water and free health clinics - to a tuition-free school for girls. By linking community services with a school for girls, we show that girls and their education are part of an ecosystem of value, and we invite the whole community to participate. Placing schools for girls at the epicenter of our programing makes schools portals for large scale social change. Many of the girls that attend our Kibera School for Girls (KSG) are bright beyond measure, but come from vulnerable homes. At KSG, they get two meals a day, a uniform, health care and a chance to flourish. In 2012, we opened a new school building in a neighboring area, Mathare, equipped with 10 classrooms, art and theater rooms, an auditorium, and a roof-top playground. We currently serve 300 students total in pre-K through 6th grade. Education has helped all of these girls find a safe haven at school and a way to be more than the circumstances they were born into. In my home, we are making progress, but there is much work to do in Kenya and around the world. Fifteen years ago, the Millennium Development Goals instituted that quality primary school education was a basic right for every child and it would happen by 2015. It's 2015, but there are still 59 million children still cannot go to primary school and 62 million girls don't get to go to secondary school. We didn't reach our Millennium Development Goals, but we have a new chance. Just a week ago, the UN General Assembly formally adopted the 2030 Agenda for Sustainable Development. This agenda targets 17 goals that will guide global policies and actions over the course of the next 15 years to create a better world. These goals include eradicating poverty, ensuring access to quality education and promoting gender equality. In Kibera, I have seen first-hand the power of young people - their boundless idealism and their insurmountable drive to make a difference. I have seen this power bring hope to a community where the odds seemed stacked too high against them. I have seen this power transform lives. I know if we can do it, youth around the world can, too. 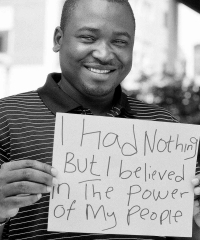 Kennedy was born and raised in the slums of Kibera, where he was inspired to start SHOFCO as a grassroots movement. Kennedy and his wife, Jessica Posner-Odede, officially launched SHOFCO in 2009. You can read about both of their journeys, the work that inspired them and their love story in their upcoming book, "Find Me Unafraid," to be released on October 13th.